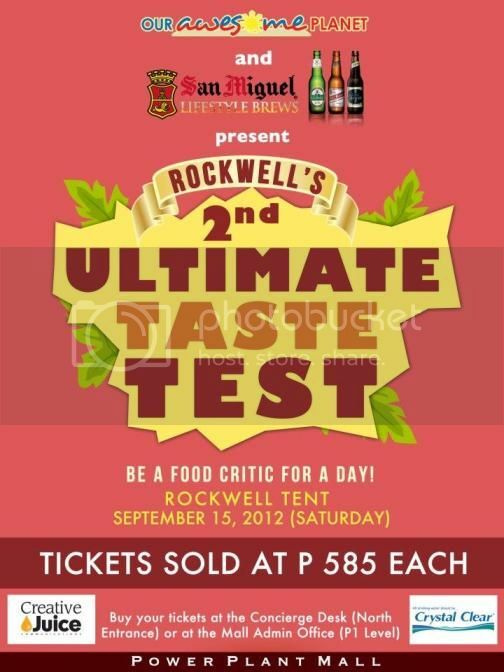 Rockwell’s 2nd Ultimate Taste Test Is Happening On September 15! How would you like to be a food critic for a day? Well, you can do that by participating in Rockwell’s 2nd Ultimate Taste Test at the Rockwell Tent this Saturday, September 15, 2012 from 11AM-9PM. This event is sponsored by Power Plant Mall, in partnership with the famous lifestyle blog Our Awesome Planet and in cooperation with San Miguel Lifestyle Brews. With a ticket that costs Php585, foodies will be given a wristband and a passport that allows them a one-time sampling of the goodies of all the participating food merchants. The foodies wil then rate the products on a scale of 1 to 5, 5 being the highest. The Top 10 highest rating food merchants will be featured in the blog Our Awesome Planet and will receive exciting prizes from Power Plant Mall. Tickets can be purchased at the North Court Concierge Desk, R1 Level of Power Plant Mall. Here’s what’s in store for the foodies: (1) premium New Zealand Natural Ice Cream, (2) Everyday Mom’s hot-off-the-oven, homemade recipes, (3) Moshi Moshi’s mod Japanese fast food offerings with a Green Tea Kit Kat to go, (4) Hillside Ranch’s hearty family dinners (5) Chow Fun by Modern Chinese Bistro’s dishes like Beer Chicken, Sour Caramel Pork, Coffee Braised Beef or Dark Chocolate Buchi. For more information/inquiries, please visit www.facebook.com/PowerPlantMall or call 898-1702 loc. 2015. This entry was posted in Our Awesome Planet, Rockwell Tent, Rockwell's 2nd Ultimate Taste Test, San Miguel Lifestyle Brews. Bookmark the permalink.